Therahealth M is a high potency therapeutic vitamin and mineral formulation recommended for people who are nutritionally deficient from not following a well-balanced diet. 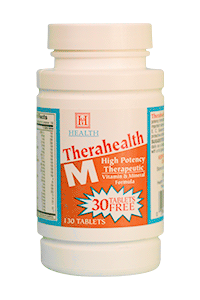 Therahealth M contains an essential mineral complex. These minerals work together, synergistically, to contribute to bone formation and health, maintaining a regular heartbeat, regulating blood pressure, proper transmission of nerve impulses, healthy prostate function, proper muscle function, and efficient wound healing. Therahealth M also provides the full anti-oxidant group and a Vitamin B complex for optimal eye and liver function, and to support the central nervous system. Vitamins A and C enhance immune function and can help to protect the body from infection, and are important for skin, tissue growth and repair, proper respiration and digestion. Adults take 1 caplet, twice daily, as a nutritional supplement.